When it comes to organizing, I need all the help I can get! 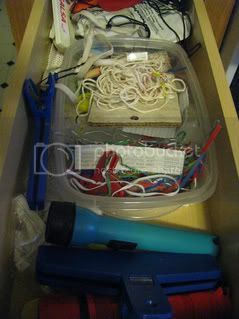 That's why I was excited when Rubbermaid offered me a chance to participate in their Quick Organizational Challenge: The Junk Drawer. Here's the new product, a six-piece interlocking drawer organizer set from Rubbermaid. Sweet. The entire set, assembled this way, measures 12" x 12", and the smallest sections are 3" x 3" square. The sections interlock, so it'll keep the configuration you set up. Each section is lined with a slightly textured surface, so items don't slide too much, and each section has no-slip feet to keep the unit in place. Very neat. Why are we keeping these broken, absolutely useless clips? We removed these child-safety latches years ago; why are they still here? Lids for cans of dog food. Haven't had a dog for ten years. No clue what this goes with. I kept it anyway, just in case! After I'd tossed the junk, I set out to organize the remaining items. 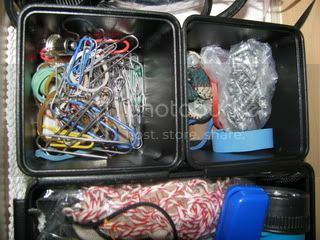 I put the loose screws into a sandwich bag and transferred the smallest items--rubber bands, paper clips, and so on--to the 3x3 compartments. As I looked at these photos, I realized that I should have taken out the non-skid drawer liner; it's not needed with this organizer. Overall, though, I'm very happy with the result! I plan to use the remaining sections (the ones that don't fit in this drawer) to organize some of the loose items in my silverware drawer. No more getting sliced on the vegetable peeler, I hope. Ready to take on your own Organizational Challenge? Buy it: Learn more about Rubbermaid No Slip Interlocking Drawer Organizers. 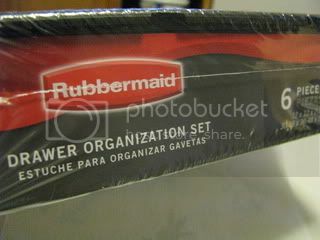 Win it: Thanks to the team at Rubbermaid, one lucky reader will win the same six-piece set that I received. Here's how to enter: Help me feel better about my clutter: leave a comment and tell me about one of your own organization challenges. Be sure to leave a way for me to contact you. Limit 1 entry by this method. This must be done in order to qualify for extra entries. If you qualify for the top-secret bonus entries, leave two comments (one per entry). More details: Open to residents of USA, age 18 or older. Giveaway ends 2/22/10 at noon (Eastern time). Winners will be chosen by the random number generator at Random.org. Each winner will be contacted by email and must claim the prize within 48 hours, or another winner will be chosen. Void where prohibited. 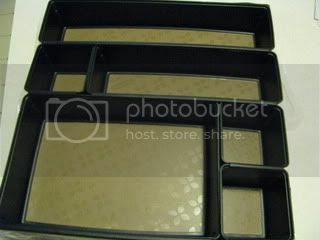 Disclosure: I received the pictured drawer organizer set, at no cost to me, for review purposes. All of the opinions in this post are mine alone. The giveaway prize is being provided by Rubbermaid. I also have a junk droawer that has not bee organized since my 3 1/2 year old twins were born. It just keep accumulating "junk". I learned that home office organizational projects are most popular. I moved into my home 4 years ago and I still have boxes of clothes in my bedroom that I have not gone through yet. I have several "junk" drawers that everything gets thrown into when we are expecting company. Feel better??? I visited the Rubbermaid blog and I read and learned about the space saver drainer. This saves counter and storage space and doesn't require an extra drain mat as most drainers do. I'm a seven-month newly wed. I'm a fan of Rubbermaid on FB. I subscribed to your blog in a feeder (MyYahoo). Oh, my.... your before drawer looks just like all 3 of my junk drawers! :-( My challenge comes from me being a perfectionist. If I can't do it right, I don't want to do it...or don't even start! I have a great many ideas of HOW to organize - and I actually LOVE doing it, but if I don't have all of the plastics and tubs and containers on hand, I only procrastinate....and procrastinate...and the junk piles higher...and higher until it's overwhelming. Well, I am the oldest of 6 children. There is never a clean spot!! We are always moving things around trying to get more room for our clutter:) Don't feel bad. It didn't look that bad:D Please enter me. Thanks!! my org challenge is in our closet! EEEEEK! One of my challenges is my daughters "hair things" drawer. I think the Rubbermaid organizer would be great for that! I read the Rubbermaid blog. I agree that just a few minutes a day will keep most of the mess down--if only I could convince my children! I have a junk drawer in the kitchen also and I have about a handful of things I have no idea what they go to but like you did with the cord, I keep them just incase. Oh my gosh Melissa, I have an entire room that needs organized. It seems in the last year everything is unorganized! I have three hutch drawers full of pictures and "stuff" that really needs organization!I keep things just as you, never know when it might be put to good use. These would encourage me to get going! Oh, PALEAZ! Your "before" picture is like a dream come true for my junk drawer! I'm pretty sure my junk drawer is bottomless...kinda like a Mary Poppins bag. The pantry is mine... all those spice jars and flavor packets. These would greatly help me organize! I learned that people buy stuff without any thought of where to put it - and realized that i do that too lol never even realized. My kitchen drawers are a mess. This would help immensely in organizing them so I can actually find stuff. hehe. I learned that the Space Saver Drainer doesn't require a tray. It drains straight into the sink. That's really cool! Less mess and it saves space. my laundry room! always a mess. thanks for a great giveaway! My junk drawer is always a mess! It seems like as soon as I clean it, it's a mess again. My junk drawer is the catch all/hide all place that I stick stuff in right before company comes over. OMGosh my junk drawer is a toe death trap, everytime you open the drawer you hold your toes in in fear that something may fall on them! My junk is drawer is packed with so many different odds and ends, I really have no idea what is actually in there! A huge challenge is paperwork! We don't file away things as much as we should and it collects. I have a lot of organizational challenges! 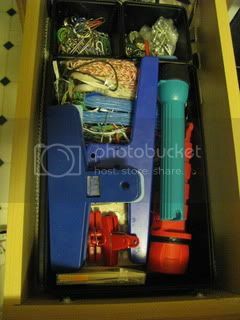 And, to me... your junk drawer's "before" picture looks pretty well-organized. :) I need help with organizing STUFF... in drawers, closets, baskets, etc. I have a hard time organizing my kitchen cabinets because I feel we don't have enough space. Well, don't feel bad; I have a "junk" drawer & I bet most of us do! I have a technology junk drawer with tons of tangled wires!! I am just going to dump everything. My kids closets! I'm horrible at purging them on a regular basis. I'm a member of Rubbermaid Club! I learned I really need the giftwrap organizer!! The reason I need organization help??? I have lived in a camper with my dear Sweetie and our dog Spot, and our 3-legged kitty Kitty and at this present time and poor sick duck who's living for another couple days in the bathtub. She's recovering quite well. So, please help me, I do need it.